It was a stunningly gorgeous day here in Northern Cali today. It is the middle of February but judging from the weather, you'd never know. Jayden and I took advantage of the beautiful day and little brother's nap time to get in some much needed one on one time. After giving him several options of things we could do, he of course chose jumping on the trampoline. Forty minutes of serious jumping and we were both tired and ready for a snack. Okay, let's be honest, I was the only tired one, that boy never runs out of steam. I was getting our snack ready and Jayden wandered into the kitchen and said he wanted to cook something together. I knew we were having tacos for dinner and so I figured we could bake up some tortilla chips. Baking them, as opposed to frying, is obviously much healthier and just as delicious. They bake up crispy with only a trivial amount of oil and then we can reap all the whole grain goodness minus all the fat. Since Jayden was cooking with me, I wanted to make it a little more fun and so we decided to cut our chips into cool shapes. I have a ton of cookie cutters, and being the boy he is, he chose a train, car, and an airplane! I threw in a few other shapes too. He was so excited when he saw his "super cool" chips, he kept asking when dinner was because he couldn't wait to eat them! He said the train was the first one to be gobbled up. 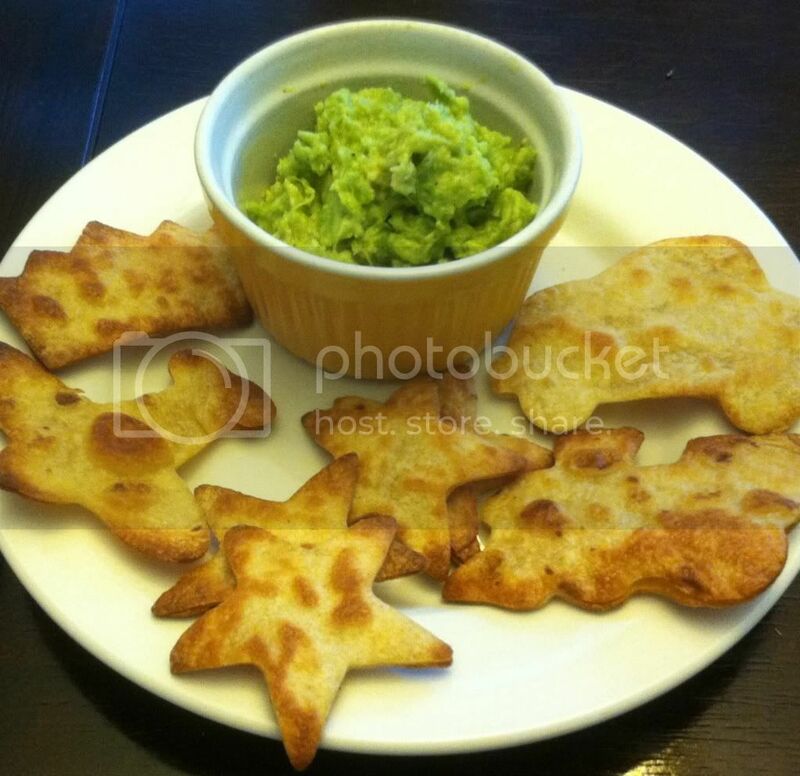 Funny how something as simple as cutting tortillas into kid friendly shapes can turn an ordinary snack into something special. Preheat oven to 400. 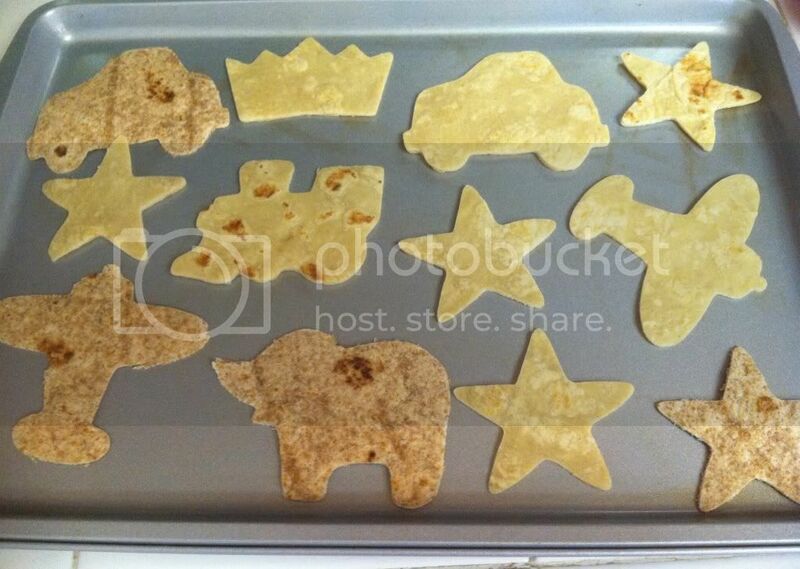 Cut shapes into tortillas and brush both sides with olive oil. Sprinkle with sea salt and place on baking sheet. Put into oven and bake 6-10 minutes, flipping once to ensure even browning. Since ovens can vary, be sure to check chips often to ensure they come out crispy and not burnt! * Save tortilla scraps to thicken tortilla soup or bake them off too! They might not look as cool, but they'll taste just as good!